Oh my … layers and layers of flaky phyllo slathered with melted butter, honey and loads of nuts – who can resist a slice of this delicious Honey Baklava Recipe?! Hey to all our baker-buddies out there! I was wondering, do you have a must-make recipe bucket list? 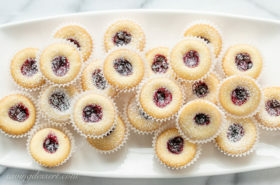 I don’t have a formal list per se, but there are tons of recipes I want to make and bake, create and eat! Good thing I’m in the recipe business! 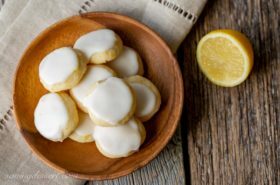 This dessert has been on my mind for years and since it’s too cold to do anything outside these days, I thought a nice baking project was just the thing for a cozy weekend in the kitchen. While this Honey Baklava Recipe is not a new creation in the world of amazing desserts, this was the first time I’ve made this delightful and delicious classic. To create this recipe I pulled ideas from numerous authentic recipes found around the world. After lots of research I used the assembling and baking methods for baklava published by Cook’s Illustrated. Ultimately, I was trying to recreate a fantastic Honey Baklava we enjoyed in a market in Vienna, Austria last spring. 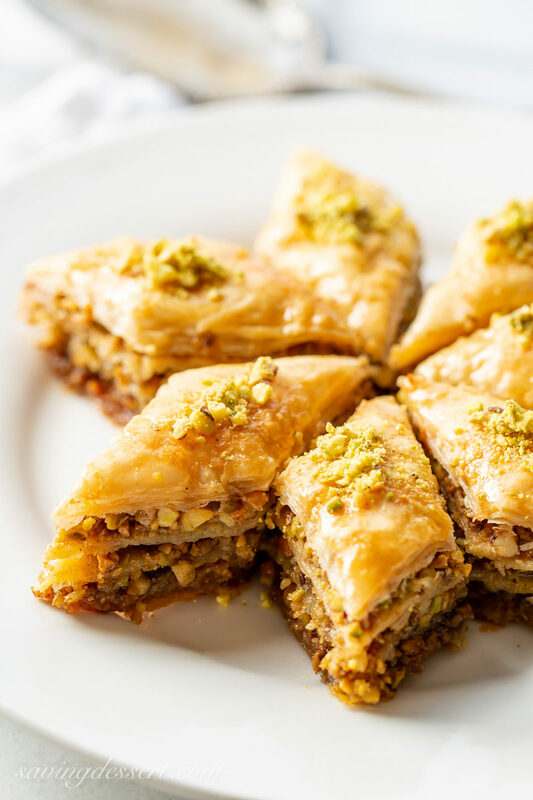 And while this baklava recipe isn’t dripping in honey like that we had in the Naschmarkt, it certainly has plenty of gooey, sticky yumminess throughout all the delicious flaky layers. Here at SRFD we have a big pool of taste testers that we use for all our published recipes. Some taste testers are, of course, family members. But others are friends, friends of family members, neighbors, and co-workers of all. As you can see, this dessert serves a bunch of people making it great for a crowd. My husband has a lot of hungry co-workers so he took the baklava to his office to share. Amazingly, all the baklava was completely gone in just a few hours. That’s some kind of taste tester record for sure! Many of his colleagues travel the world and have enjoyed baklava in the Middle East, Greece, and other Eastern Mediterranean countries. They all LOVED it and said it was the best Honey Baklava recipe they’ve ever had. Sometimes I wonder if they just say such things to ensure their first tier taste testers positions, but who knows! a sharp chef’s knife to cut the phyllo into a round shape to fit the pan, and to cut Baklava into diamonds. A super sharp paring knife will work well too. a large cutting board to cut the phyllo. 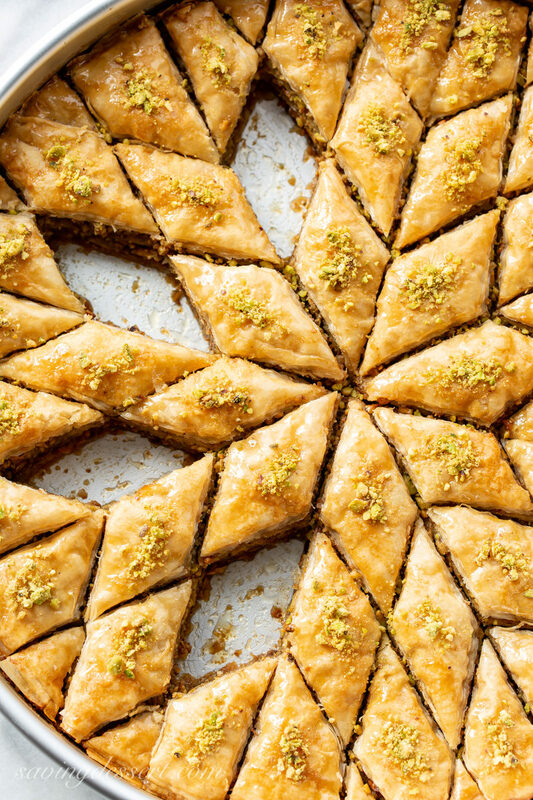 There are plenty of moving parts to this Honey Baklava Recipe, but it’s not hard to make. Reading through our detailed, easy recipe a few times will ensure a successful bake. Having all ingredients pre-measured and at the ready is key to easy assembly. And don’t worry, you don’t have to use a 12-inch round baking pan to make this Honey Baklava Recipe. I’ve included directions for a smaller baklava recipe baked in a 13×9-inch baking pan. If you want to make a round baklava too, I bought my 12-inch baking pan at Michael’s and had a 50% off coupon. The pan cost $6.74! 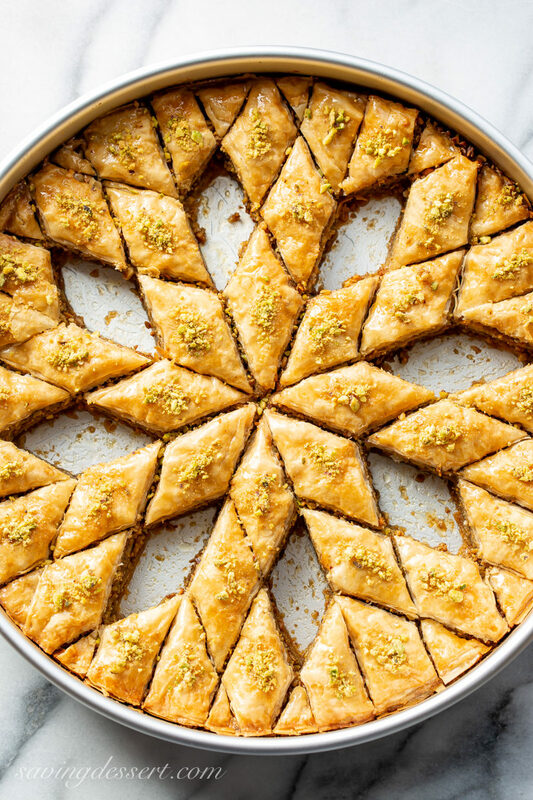 As show here, this recipe makes 48-50 small pieces of baklava. Good thing baklava keeps well for up to 10 days to 2 weeks at room temperature tightly wrapped in foil. Not everybody needs a big 12-inch round baking pan, I get it. However, my daughter makes birthday cakes for all her friends and family so I thought she could use this pan, and I could too. We like to share! Click on the photo for more information about purchasing this 12×3-inch baking pan from Amazon. Lucky me, I had a 50% off coupon for Michaels Stores so I bought mine there – paid $6.74 for it. SOLD! Layers of flaky phyllo, pistachios, walnuts and a sweet honey lemon syrup poured over the while hot. a sharp chef’s knife to cut the phyllo into a round and to cut Baklava into diamonds. A super sharp paring knife will work well too. Combine the honey syrup ingredients in a deep medium saucepan. Bring to a full boil over medium-high heat, stirring occasionally until the sugar is dissolved. (Don’t walk away as it may boil over!) Reduce heat to medium low and simmer without stirring, for 5 minutes, but watch it carefully. Remove from the heat and cool for slightly. Pour into a measuring cup with a spout and cool completely. The honey syrup can be made ahead and refrigerated for up to 4 days. Pulse the pistachios in the food processor until very finely chopped, about fifteen 1-second pulses. Pour the pistachios into a medium bowl. Pulse the walnuts in the food processor until very finely chopped, about fifteen 1-second pulses. Add the walnuts to the bowl with the pistachios. Add the cinnamon, sugar and salt to the nuts and mix well to combine. Adjust oven rack to lower-middle position. Preheat oven to 300 degrees F.
Brush a 12-inch round baking pan with the melted butter. Set aside. Carefully unfold the phyllo onto a large cutting board. Gently smooth out the phyllo with your hands to flatten. Place the baking pan on top of the phyllo stack. Using the pan as a guide, cut the stack of phyllo to fit the pan. You will need about 30 round sheets of phyllo for this recipe. Cover the phyllo with plastic wrap, then a damp kitchen towel to prevent drying. Set aside. I recommend keeping a pencil close by to keep track of the phyllo. If you get interrupted, the phone rings or the dogs need out, it’s easy to lose track of how many layers you have already buttered and put in place. Place one phyllo sheet in the bottom of the baking pan and brush with butter until completely covered. Repeat with 7 more phyllo sheets brushing each with butter. Make sure there are no large bubbles of air trapped under the phyllo. The air bubbles can be smoothed out with the pastry brush easily. Distribute 1/3 of the nut mixture over the phyllo. Cover the nuts with another sheet of phyllo. Drizzle with butter instead of brushing as the phyllo will slip and move if you use pressure. Dab the butter around to cover the first sheet. Repeat with 5 more phyllo sheets, brushing each with butter. Layer 1/2 of the remaining nut mixture over the phyllo, then repeat with 6 sheets of phyllo and butter, and then the last of the nuts. Finish the stack with 8 or 10 sheets of the phyllo, brushing all but the final sheet with butter. Using the palms of your hands, gently compress the layers, starting in the center and working outward to remove any air pockets. Spoon about 4 tablespoons butter on the top layer and brush to cover the entire surface. 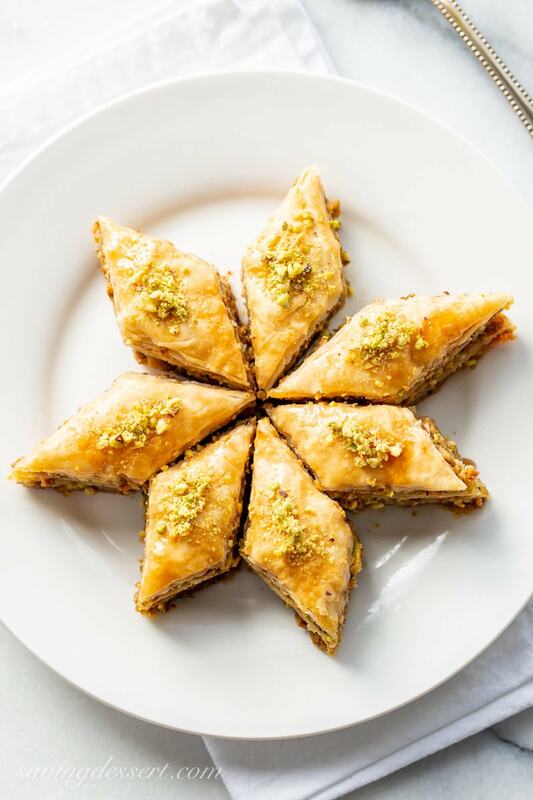 Using a sharp chef’s knife with a pointed tip, cut the baklava into 4 equal wedges, then each wedge in half to form a total of 8. Working within one wedge at a time, make two straight cuts, 1 inch apart, parallel to one side of wedge. Make two more cuts, parallel to opposite side of same wedge, creating a diamond pattern. Repeat process in remaining 7 wedges. See photos for help - it’s a visual thing. Bake until golden and crisp, about 1 1/2 hours, rotating the pan halfway through baking. Immediately after removing the baklava from the oven, slowly pour the cooled honey syrup over the cut lines until about 1/2 cup remains. Drizzle remaining syrup over the surface. Sprinkle each piece with a pinch of ground pistachios or walnuts. Cool to room temperature on a wire rack, about 4 hours. Cover with foil and let stand at room temperature for 8 hours or overnight before serving. The flavor improves after resting overnight but is ready to serve once cooled. Baklava can be wrapped tightly in foil and kept at room temperature up to 10 days. 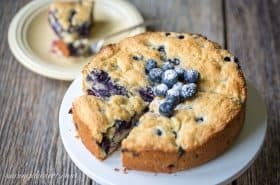 TIPS: For this recipe I used a 12-inch round cake pan. Cutting the phyllo into round sheets causes more waste of phyllo than using a rectangular pan. If you prefer, use a traditional straight-sided metal 13 by 9-inch baking pan. 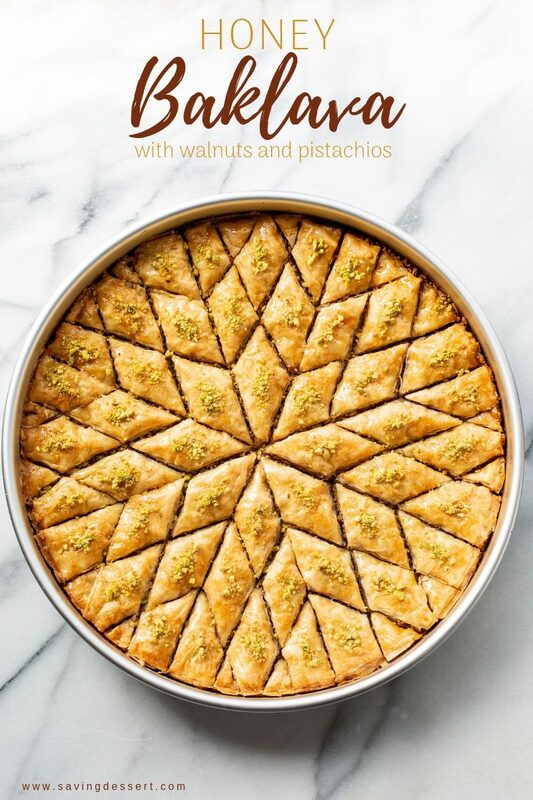 If you use the 13 by 9-inch pan, reduce the pistachios to 8 ounces, the walnuts to 8 ounces and the phyllo to 1 pound. 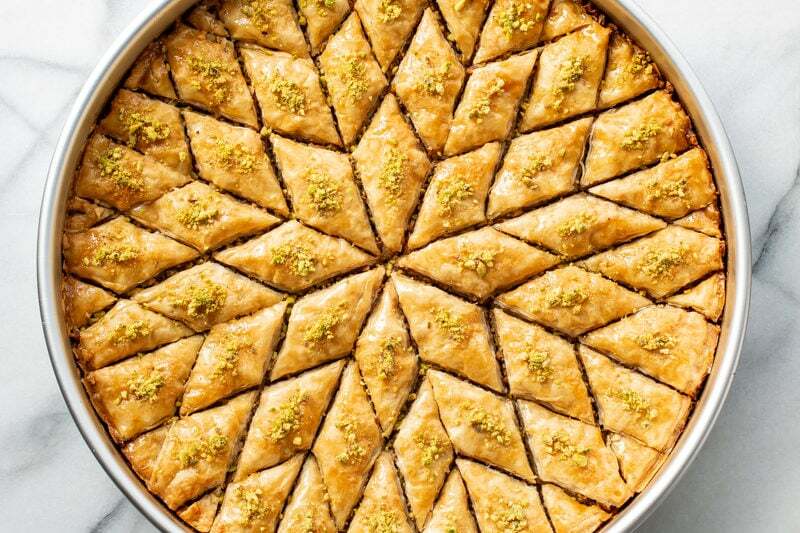 DO NOT use a non-stick baking pan as it will be marred when the baklava is cut. A glass pan will work fine if you don’t have a metal (NOT NONSTICK) pan. Also if making the smaller pan of baklava, reduce the honey syrup to: 3/4 cup sugar, 3/4 cup of water, 1 cup honey 1 1/2 tablespoons fresh lemon juice and 1/8 teaspoon salt. 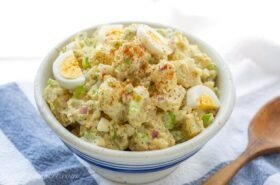 Inspired by several recipes with the basic instructions adapted from Cook’s Illustrated. I haven’t tasted Baklava in years but I remember how delicious it was when I did! This is so beautiful and Middle Eastern bakery worthy, Tricia. Thanks Susan – it’s such a special treat! I love, and have always wanted to make, Baklava! Seeing the beautiful pictures of the recipe you made gives me confidence to try it. While it appears complex, the steps you list seem like it’s something I could tackle. My coworkers, along with my husbands coworkers, and family are our taste testers and I know they would love this one. Galaktoboureko is another favorite and I’d like to give it a try also. Thanks Julie! I hope you will try. It’s so much easier than you’d think. Bet your taste testers love it too 🙂 I’ll have to look into the Galaktoboureko. Thanks again! I’m not a fan of walnuts and pistachios, can pecans be substituted? wow Tricia, this one looks phenomenal! Wish I could have a slice with my tea now…the layers of goodness are totally irresistible. Thanks Angie – I was very glad to get this out of the house or else I would enjoy it a little too much! Um…..wow. That’s all I can say, it’s just spectacular! 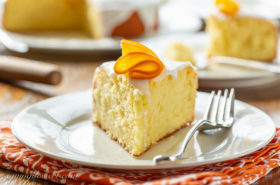 I have always loved this dessert but never dared to attempt it, but I think you’ve inspired me!! Mine have never been this gorgeous.Never.Beautiful Tricia. That looks fabulous Tricia and my wife and daughter would love it. Such a creative way to cut it. You are going to love making it Jennifer – such a fun project. Those lucky taste-testers! Bravo to you Tricia, this looks as good as any baklava I’ve ever had! And that fancy cutting is absolutely gorgeous! Thanks Chris – it was a fun project and I would make it again in a heartbeat.